I visited a blog for this weekend and when the owner of the blog saw my blog name it reminded him of this particular comic. These are the regular features you will be able to read and see on Morning Erection. Interspersed among the regular features will be my regular run of the mill spasms from my imagination. ME Times allows for me to interview people that I find interesting. Actually it allows me to interview anyone. Everyone has a story to tell and I was inspired to start interviewing people from from the TBS Characters Showcase. Anybody and everybody is important enough to tell their story and everyone deserves their fifteen minutes of fame. Morning Erection Times will be alternating posts on the 15th of every month with a new segment I am starting called Bi-monthly Challenge. See the first and only interview completed thus far. This is just the second year for Blogging Honesty. Last year we utilized the month of May and this year, April. One or more people come up with the total number of questions needed for the month and everyone who participates answers the questions as brutally honest as possible. It is not for the faint of heart or the timid because the questions might be tame but some of the answers can range from G to NC-17 and we all expect the truth from each other. If you don’t think you can tell the truth, you should not be a part of this. This year is a little different in that there are 30 questions and one final dare at the end. It is nothing strange, infantile or illegal, but only meant for each person to get a little out of their comfort zone and have some fun. I have found from last year’s Honesty month that even the one’s not participating directly do enjoy reading the answers and getting to know other bloggers just a little better. I cannot say for sure that he saw my site and copied. Sometimes there are two great minds on the Earth at the same time (you have my permission to laugh)! On February 25th as I was preparing my thank you for Mai’s guest post I noticed a little orange number one next to my name. When I clicked on it Jenni from OhJenni.com had followed my blog. Strange I thought. I don’t remember her ever leaving a comment or sending me an email and I know I had not been by her site. I was intrigued. I went to her site and she had created a post about my Morning Erection. 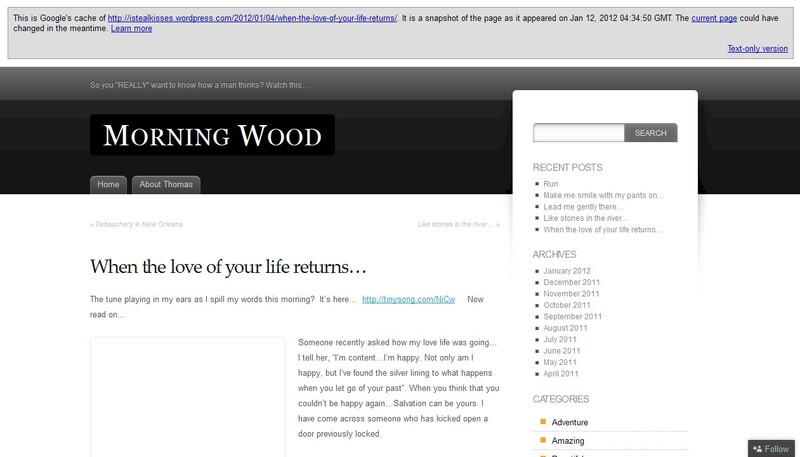 Both her and her readers were confused by my blog because there once was a guy named Thomas who had a blog called Morning Wood. His site is now defunct but everyone on her blog thinks the similarities between us two guys and the two blogs are too close for me not to be this ‘other’ Tom. I don’t know how the similarities came about because I did not know this other blog existed but perhaps he copied from me? What I do know is I might as well try to steal over to my blog, those bloggers who used to visit his! Sounds like a plan. Don’t hate. Although the blog is deleted Google has cached some of his posts. You can view a few of them here (images were removed by Google). He even used the same theme as me. Freaky deaky. Please, someone, anyone, tell me honestly that you do not think I am that other Thomas guy. Thomas if you are out there, feel free to interject anytime! That has got to be my most clever post title ever.